Strange Invisible Perfumes Lady Day was inspired by jazz vocalist Billie Holiday, who was known affectionately to her fans as Lady Day and who always performed with white gardenias in her hair. The fragrance notes are gardenia, lemon verbena, blood orange, jasmine, and sandalwood. Lady Day opens with a burst of gardenia. It is heady and overbearing, much like a freshly cut gardenia flower, and too much of a good thing for the first 20 minutes or so. Once it calms, it is downright gorgeous. The gardenia is lush, but not overly sweet, and complemented by a beautiful jasmine note. It is brightened by the citrus, and there is something nicely dry, possibly orange blossom, that saves it from being just another tropical floral. After an hour or so, the gardenia mostly fades away, as gardenia is wont to do, but a lingering drydown of jasmine, sandalwood and light resinous notes lasts for hours more. It is a fitting tribute to one of the greatest jazz singers of all time, and highly recommended for gardenia lovers. Note: the picture of Billie Holiday is from Institute of Jazz Studies, Rutgers University Libraries. Update: Lady Day is no longer available on the Strange Invisible Perfumes website, but is reportedly sold via phone order. R, that overbearing burst of gardenia sounds like something that would make this perfume very popular. Gardenia lovers are no-holds-barred, and wouldn't sniff twice at a 'fume that didn't have that intensity. The persistence of the drydown sounds wonderful — all in all, a beautiful tribute to Lady Day, I'd say. A, I am surprised this isn't one of the fragrances going to Barneys, it is IMHO more “accessible” than some of the others. Great review! I wonder how she is able to extract gardenia. I always read that they are impossible to exract (by this I assume, with conventional methods). However, if Alexandra is using her own technology, then it might be possible. Anya is probably the one to answer this question. Sounds gorgeous R! I wanna try this. Like V, I am curious about the extracting gardenia bit. Great review as always dear R! I definitely see this fragrance in my future. I'm a lifelong fan of Billie Holiday's work — the epitome of world-wearyness and ennui. I've always felt that if there were to be a 'scent'track to her music, it would be redolent of gardenia and night-blooming jasmine. And of course I'm SUCH a floral girl….. 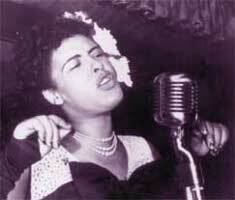 I love Billie Holiday too. This does not carry over the world-wearyness & ennui, really. It isn't a melancholy scent, at least to me…perhaps it matches her earlier days (Billie Holiday on Columbia) rather than her later (on Decca & Verve). That's an excellent observation, my friend. Towards the end of her career, Billie's voice was hoarse from so much stress, both emotional and financial, and of course from her tragic addiction to heroin. But the spirit, the very essence of her art, still managed to shine through all of her troubles. Gardenia absolute is rare, rare, rare. Also often tweaked with synthetics. We're having a discussion about this on my yahoo group right now, and I'm composing a long reply, quoting Arctander and putting in my own two cents. Gardenia absolute is possible. It takes 5000kg to make 1kg, so it is very pricey. In recent decades, China has jumped in the game, and well, Chinese products are known for being tweaked. Fact of life. That said, unless you KNOW the source, or make the stuff yourself, I'll wager it's tweaked. Natural perfumers like A.B. and everyone on my group try to work on faith and a prayer that the raw materials are not tweaked. I doubt A.B. has the solvent extraction equipment to make her own gardenia absolute (it's a dangerous operation, requiring much more skill than distillation.) Too bad that question couldn't have been posed in the interview, but, of course, it has come up afterwards. So we look for answers. I don't have the definitive one. Libra waffle waffle, lol. Jeanne Rose has a refrigerator method for extracting lilacs and other impossible-to-extract flowers in alcohol. That may work. Oh, another thing. Some very, very talented perfumers can combine materials to approximate elusive, hard-to-extract scents, like lilac. Terry of dragonflyaromatics makes a gorgeous lilac accord from lotus and a lot of other stuff I forget. It is fleeting, and not quite 100%, but it is beautiful and definitely lilac-y. Back to the gardenia: it may very well be that someone in Grasse or China is the bona fide source of A.B. 's gardenia absolute (if that is what she used.) I often hear – late in the game – of niche distillers or extractors producing a marvelous aromatic. If anyone hears of one, let me know! Hi R! I have the Lady in Autumn set from Verve, and find it too depressing to listen to all at once. I need a spot of Ella to cheer me up afterwards, LOL! I like the mid-career recordings from Decca the best. Thanks K, I don't think I've tried anything from Lulu Beauty & will have to check that out. S, it does have some resinous notes, but it isn't a dark scent. Some light scents can be melancholy too (Guerlain Apres L'Ondee) but this one doesn't strike that way. M, I would say that Lady Day and L'Invisible were the two “easiest” of all the ones I've tried…although haven't tried all the ones that will be exclusive to SIP, only the whole set from Barneys. A, thank you so much for the detailed explanation, that is really helpful. Unless I misunderstand AB's printed materials, she does not claim to distill ALL of her ingredients in-house. Gardenia is a difficult oil to find unadulterated on the market today. Most of it is synthetically produced. We have not been able to source a pure gardenia absolute for awhile, therefore, we are offering a natural blend gardenia. This is a blend of natural essential oils and absolutes to create a scent similar to gardenia. It is very nice but is still expensive. It has a rich, heady, sweet floral aroma. Gardenia is normally not one of my favorite florals, but this one sounds really gorgeous! Maybe one day if I feel extravagant, I will splurge on a sample vial or two from this line. Very interesting discussion on essences. I didn't realize gardenia was so difficult to extract. Same with lilac. Lilacs are one of my absolute favorite flowers, and there are very few scents on the market with this note (real or synthetic). Thanks A, you are a real fountain of information! Do come back & comment if you try Lady Day, I would love to know if a non-gardenia-lover would like this. I assume the stephanotis flower is similarly hard to extract, in the way gardenia and lilac are. Sad, because the scent of stephanotis is something I've never smelled in any perfume, including the supposed stephanotis scents by by Crown, Floris, and Caswell-Massey. None of them come close. To me the flower is like jasmine and bubblegum with a hint of tuberose and the slightest bit of cinnamon/carnation. So amazing! I wonder if anyone knows of something, synthetic or not, that smells like the real thing? I used to grow stephanotis when I lived out west, and have never smelled any perfume that smelled like the real flower. Haven't really gone looking though — haven't even smelled the Floris version. I recently called the SIP boutique and asked about Lady Day. At the request of the Holiday family, they have renamed it. Now it's called Untitled. An EDP version will be released in late July. K, that's great news, thanks! I may just have to buy it if it's in EdP.